Show how each compound can be prepared from an alkene containing 3 carbons (or less). Each answer will involve the reaction of a Grignard with either a carbonyl or epoxide. Note: epoxides are prepared from alkenes using a peroxy acid (epoxidation) such as mCPBA. 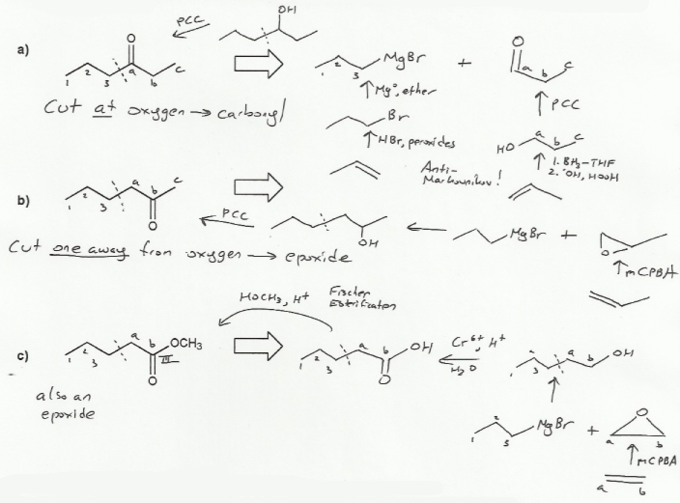 The trick to synthesis problems in second semester organic chemistry to recognize that alcohols ARE ketones ARE carboxylic acids. What do I mean? Alcohols, ketones/aldehydes, and carboxylic acids can all be easily converted using PCC or Jones Reagent (NaCr2O7/H2SO4). For example, for a), the product is a ketone, but it may as well be an alcohol, because alcohols can be converted to ketones with PCC. 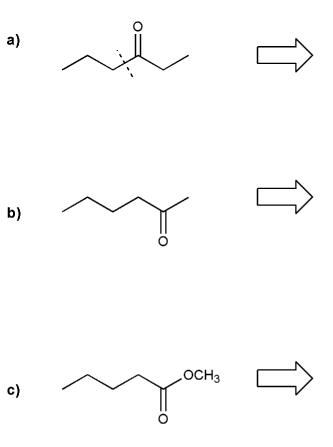 b) is similar, except the position of the alcohol (one away from the "bond cut", instead of directly connected to the cut as in a) ) indicates the starting material was an epoxide and not a carbonyl. c) is just like b), except instead of PCC, use Jones Reagent to oxidize the alcohol all the way to a carboxylic acid. MendelSet practice problem # 673 submitted by Matt on July 19, 2011.